In this episode of Inbound Sales Journey, Gray and Ryan discuss their pre-sales call preparation. Right before the call is crunch time as a sales person. You want to make sure you're prepared and have the best opportunity of closing a qualified deal. This is the obvious first step. You want to get a feel for the company and learn if they're a good fit, figure out the industry, so you have good questions to ask, and also get an understanding of their current marketing efforts. This will give you a good idea of where they're starting from in marketing. It will help you get a feel for what their needs actually are and not just what they're telling you. You can also use this research to have some suggestions on the first call, which allows you to add value and demonstrate expertise. You want to research the contact with company bio or LinkedIn. It's good to get an understanding of the person you're talking to, but it's a great chance to find a way to a point you can connect on. Rapport building is key to sales, so doing some research will help you find a commonality you can use in the conversation. It's also good to learn where they originated from and any information you have on them regarding the project or who referred them. This will help you keep the meeting targeted as well and focus on the important issues. You can be prepared for questions they're asking as well as what they're looking for, so you're not wasting your time with a poor fit prospect. This is easy to forget, but life gets busy for clients, and they may forget about your call. Before the call, send them a quick reminder. You don't want to be losing out on qualified prospects, so take the time to make sure they're all set. Just a simple step like sending a reminder email can help increase your sales. After the call, you want to make sure you have detailed notes and homework for you and the prospect. Make sure that if there's a next call, they have what they need and have done the required work. This also means sharing notes, and next steps with the contact as well as whoever else is on the next calls. Just an extra 10-15 minutes preparing for a sales call can make the difference between gaining a new client or missing an opportunity. 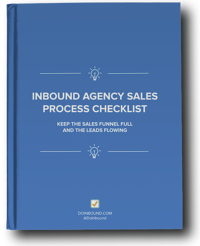 Every agency needs to make sure they are taking the time to prep for sales calls to get the best results for their agency.